This shadow box is a representation of Gerda Weissmann’s journey through the Holocaust. The flowers are there because when Gerda was little, before she was taken to a concentration camp, she had a garden in her neighborhood that she loved. When the Nazis took over Poland, they didn’t allow Jews to enter and put a fence around the garden. This is also why there is a fence around this piece. The spool of thread represents that she worked in a textile factory making clothes for the German soldiers when she was in the concentration camp. When she was working there she kept her mind busy but deciding if she liked the red dress more than the blue dress to wear to her birthday party. 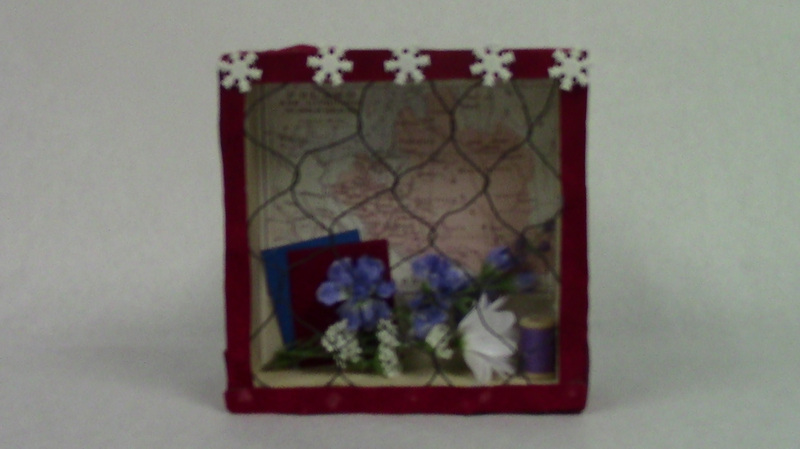 That is why I put the red and blue pieces of fabric in my shadow box. Finally the snow flakes along the top represent that she went on a death march and survived all because of her snow shoes. It was extremely cold and some girls were wearing sandals on this march through the night but Gerda had her snow shoes. If she didn’t she might not have survived to go on and tell her story.